This pink Dogwood 5 1/2" Cereal bowl is in excellent condition. 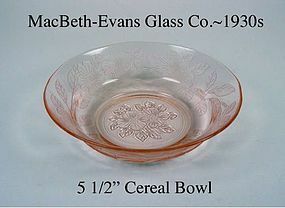 It was made by The MacBeth-Evans Glass Co. in the 1930's. 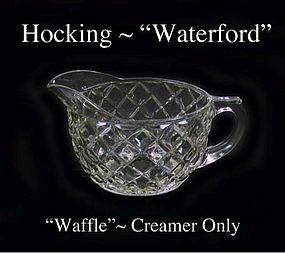 Waterford Waffle creamer only by Hocking Glass Co. in the late 1930's. Excellent condition! 1 available @ $7.00 each. 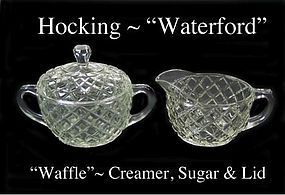 Waterford Waffle creamer, sugar bowl & lid by Hocking Glass Co. in the late 1930's. Excellent condition! 1 set available @ $14.00 each. 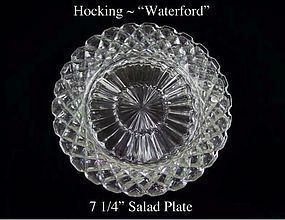 Waterford Waffle 7 1/4" salad plate by Hocking Glass Co. in the late 1930's. Excellent condition! 4 available @ $6.00 each. 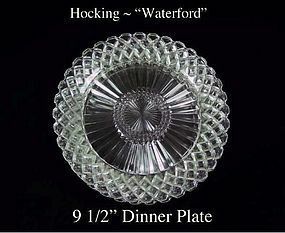 Waterford Waffle 9 1/2" dinner plate by Hocking Glass Co. in the late 1930's. Excellent condition! 4 available @ $8.00 each. 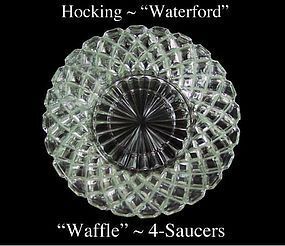 4 Waterford Waffle 5 7/8" saucers by Hocking Glass Co. in the late 1930's. All 4 for one money! Excellent condition! 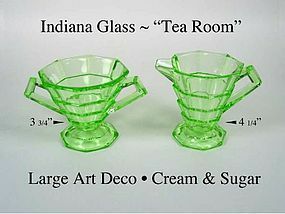 This Tea Room green creamer and sugar are the large size and were made by the Indiana Glass Co. in the late 1920's. This art deco style glass was very popular in soda shops and ice cream parlors in the 1920's and 1930's. Both pieces are in excellent condition! 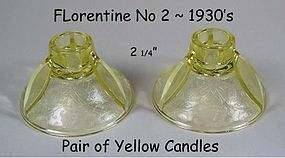 These yellow Florentine Poppy No 2 single candles are in excellent condition! 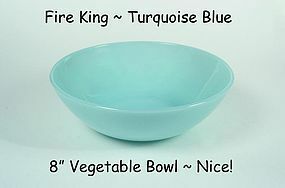 They were made by the Hazel Atlas Glass Co. from 1932-1935. Beautiful! This pink Miss America 10 1/4" dinner plate is in great condition! Very minor normal use marks. 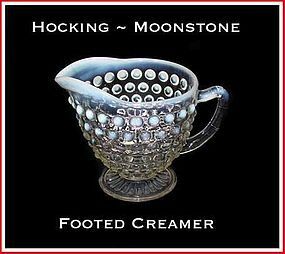 This opalescent Moonstone creamer was made by The Hocking Glass Co.in the 1950s and is in excellent condition! 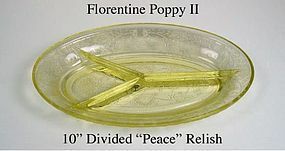 This yellow Florentine Poppy #2 10 inch Peace relish tray is in excellent condition! We call it the "PEACE" relish because the dividers form the PEACE sign. 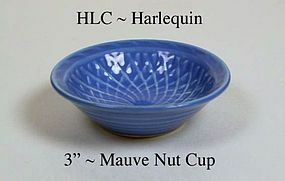 This Harlequin basket weave Mauve nut cup was made as a novelty companion item for the Harlequin pattern in the late 1930's. It is in excellent condition! This green elegant style mayonnaise spoon is in excellent condition! 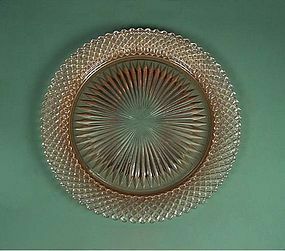 It was made in the 1930's and 1940's by an unknown glass company. 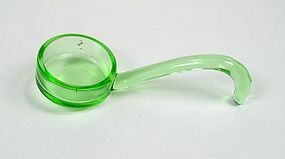 This 1930's green kitchen mayonnaise spoon is in very good condition with no chips and no wear. There are a couple of tiny black spots in the glass from the manufacturing process. 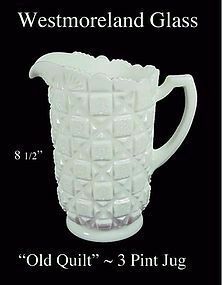 This 1950's "Old Quilt" 3 pint jug was made by Westmoreland Glass Co. and is in excellent condition! 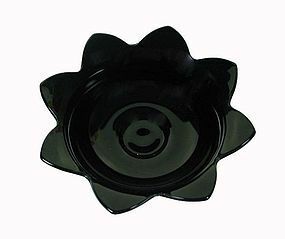 This 1930's 9 inch footed console bowl, with petals, was the main piece of a 3 pc console set with candles. It is in excellent condition! 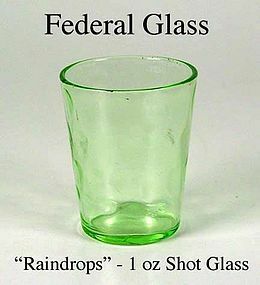 This Raindrops 1 oz shot glass was made by the Federal Glass Co. in the 1930's and is in excellent condition.